…and, borrowing a page from your playbook, we now live web-stream our Judicial Council meetings. And, I’m excited to say, that soon we will live stream our oral arguments at the Supreme Court. 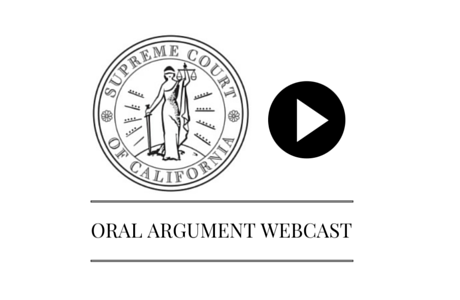 The webcasting of all oral arguments is a natural evolution for the broadcasting and streaming partnership with The California Channel that began in 1991. Initially it involved cases of heightened public and media interest and included the court’s annual outreach and special sessions from 2002. 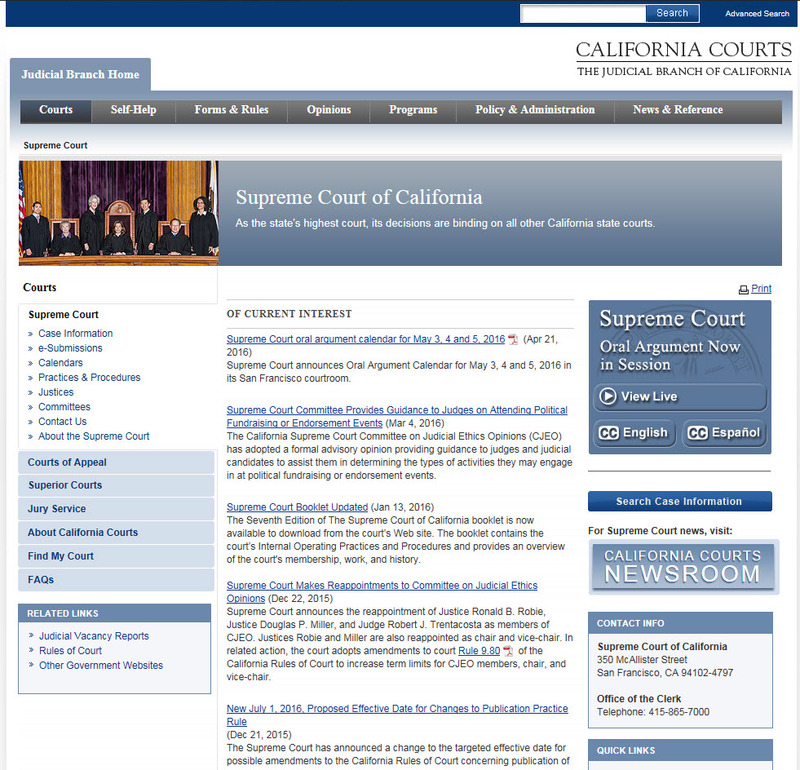 The Supreme Court of California will also add real-time captioning in English and Spanish to the video and audio livestream to expand accessibility to the court’s proceedings. A companion document to the livestream will identify the justices as seated on the bench, the cases in each session, the counsel representing the parties in each case, and the issue(s) under review by the court. It will also link to the case Docket and the Briefs filed for each case. 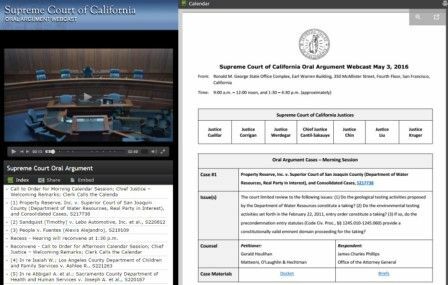 “The court’s decision to live-stream its regular oral argument sessions is a logical progression for its outreach efforts—using technology to open the courtroom doors to students, practitioners, and the public throughout the state and the nation. It promises to create a greater understanding of the integral role of the court in our constitutional democracy, deciding matters of statewide importance and maintaining uniformity in the law,” commented Frank A. McGuire, Court Administrator and Clerk of the Supreme Court of California. 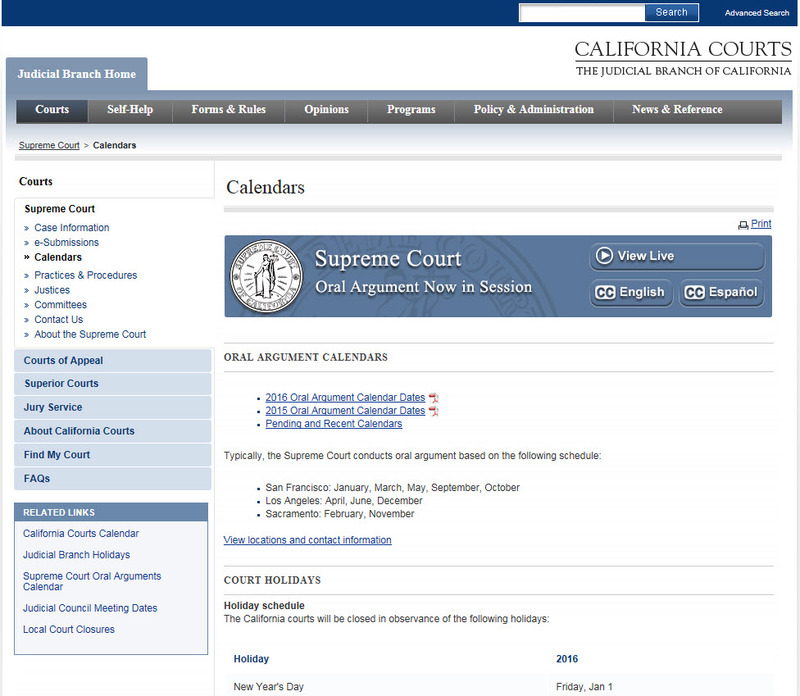 The webcast can be accessed through website buttons posted at the time of oral argument on the California Courts website (the home page, the court’s home page and calendar page). There will be buttons that link to the live video stream and the captioning in English and Spanish. The oral argument sessions will begin each day on May 3, 4, and 5 at approximately 9:00 a.m., recess at 12 noon, and reconvene at 1:30 p.m. The court will hear 15 of the 18 cases set for the Oral Argument Calendar—one case has been abated and two cases have been continued until the late-May calendar. The court will webcast again with the late-May calendar in San Francisco and then audiocast with captioning the June calendar in Los Angeles as the audio-visual systems are updated in that courtroom. Webcasting will begin again with the September calendar, becoming a regular feature of the court proceedings.